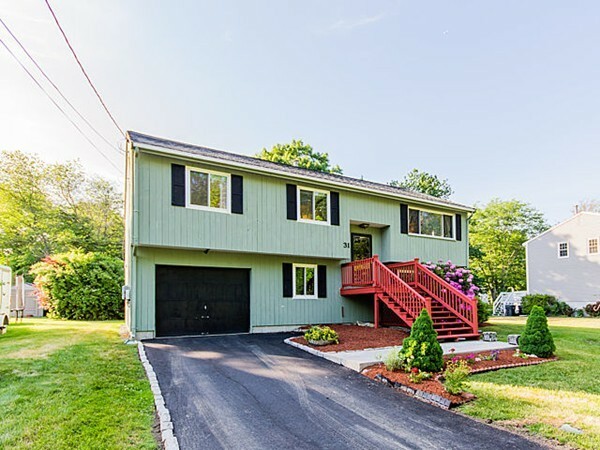 Updated raised-ranch with great open spaces and an abundance of natural light. Enjoy birthday parties, holidays and entertaining family and friends. Cabinet packed kitchen with granite counters and island open to dining room. Stunning and bright 3 season family room addition with vaulted ceiling. Lower level 4th bed, 3/4 bath with laundry, nice office space and family room. Step out to grill or dine and sip your favorite beverage and relax on the large deck. Nature lovers will appreciate the acres of conservation. Perhaps you would like to stay inside to keep cool in the central air. Commuters and shoppers delight...just minutes to 2 commuter train stops, legacy place and University station Westwood. Greenlodge school district and nearby ECEC kindergarten/pre-school. Great neighborhood feeling. Many updates include new windows 2013, high-efficiency heating and central A/C system 2010. New dishwasher 2012, new fridge 2012, new driveway 2015. Offers reviewed by Monday June 15 at 5pm!